President Trump has accused Peter Strzok of committing "treason." Peter Strzok, the FBI agent who sent anti-Trump texts, engaged in angry exchanges with House Republicans Thursday as he testified for the first time in public at a joint hearing before the House Judiciary and Oversight committees. One of the first exchanges began when Rep. Trey Gowdy, a South Carolina Republican, said he "didn't give a damn" as Strzok tried to explain the "context" around the texts including one that said "we will stop it," referring to then-candidate Donald Trump. "I don't appreciate having an FBI agent with an unprecedented level of animus working on two major investigations in 2016," Gowdy said. 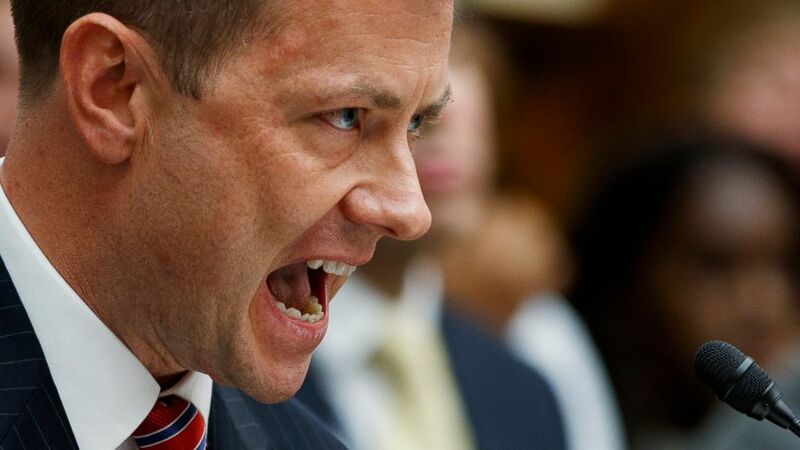 "What I can tell you is that text in no way suggested that I or the FBI would take any action to influence the candidacy of candidate Trump," an angry Strzok replied. In his opening remarks, Strzok told lawmakers that his texts "have created confusion and caused pain for people I love" and "have provided ammunition for misguided attacks against the FBI, an institution I love deeply and have served proudly for more than 20 years." 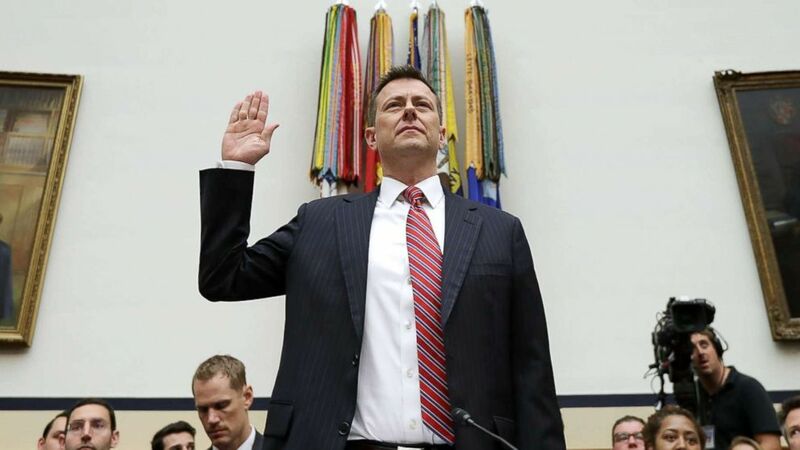 (Chip Somodevilla/Getty Images) Deputy Assistant FBI Director Peter Strzok is sworn in before a joint hearing of the House Judiciary and Oversight and Government Reform committees on Capitol Hill, July 12, 2018 in Washington. As he concluded the remarks, he took a shot at Republicans who have harshly criticized him, saying they were helping Russian President Vladimir Putin. “I understand we are living in a political era in which insults and insinuation often drown out honesty and integrity,” Strzok said. “I have the utmost respect for Congress’s oversight role, but I strongly believe that today’s hearing is just another victory notch in Putin’s belt and another milestone in our enemies’ campaign to tear America apart,” he said. The committees are looking at the actions of the FBI and Justice Department during the 2016 presidential campaign. President Donald Trump and his supporters have cited Strzok's texts with his former FBI colleague Lisa Page, with whom Strzok was having an extramarital affair, as evidence of political bias within the FBI during the 2016 presidential campaign. Strzok's appearance came as House Republicans have demanded testimony from Page after she did not comply with a subpoena to appear before the committee for a closed-door interview on Wednesday. She is scheduled to appear Friday behind closed doors. Strzok, who led the Hillary Clinton email investigation, spoke to the committee behind closed doors last month for almost 11 hours. Just shy of 8 p.m., Judiciary Committee Chairman Rep. Bob Goodlatte, R-Va., gaveled out, ending the 10-hour marathon hearing. As the hearing wrapped, the ranking Democrats on the Judiciary and Oversight Committees, Rep. Elijah Cummings, D-Md., and Rep. Jerry Nadler, D-N.Y., released a statement calling Thursday's partisan spectacle “a giant love letter to President Trump”. In a reprieve from the mudslinging that has largely defined the hearing, Strzok took a moment to explain the meaning of a particularly ponderous text he sent Lisa Page that has come under scrutiny from those across the political spectrum. The text refers to an “insurance policy," but lacks the context necessary to understand its meaning – making it fertile ground for partisans on both sides of the aisle. “I want to believe the path you threw out for consideration in Andy's office” – the text reads, referring to then-FBI Deputy Director Andrew McCabe – “that there's no way he gets elected,” – referring to Trump – “But I'm afraid we can't take that risk. It's like an insurance policy in the unlikely event you die before you're 40…"
Many Republicans, supporters of President Trump, and even the president, himself, have suggested that Strzok’s “insurance policy” text referred to an FBI plot to prevent Trump from winning the 2016 election. “The ‘insurance policy’ text that has come up before – that text represented a debate on information we had received from an extraordinarily sensitive source and method,” Strzok said, going on to describe how one faction of the FBI advocated a measured approach to investigating possible Russian collusion. Strzok says he represented the other faction within the FBI, advocating to aggressively investigate possible connections between members of the Trump camp and Russians in case Trump won. Nearly nine hours into Thursday’s hearing, neither Strzok nor congressional Republicans seem to be letting up, continuing to trade barbs, accusations, and shouts. An accusation from GOP congressman Rep. Mark Walker, R-N.C., reignited what has already been an unusually fiery grilling – even by House hearing h standards. “This is an integrity issue,” Rep. Walker said, discussing the content and volume of Strzok’s text messages. When he had a chance to respond, Strzok slammed Rep. Walker’s assertion, raising his voice yet again. With a handful of lawmakers still waiting for their time to question the beleaguered former FBI agent, we may very well stretch into a tenth hour. As the hearing grinds on, members appear to be more interested in pontificating than asking Strzok any meaningful questions. One moment worth noting, however, was Strzok’s response to a question about how the FBI came to launch their investigation into possible connections between some members of the Trump campaign and Russia. “Was the [Steele] dossier a part of why you opened up the investigation?” Rep. Ron Desantis, R-Florida, asked. “No,” Strzok said, before refusing to answer follow-up questions regarding other suggested beginnings of the investigation, on the advice of FBI counsel. The so-called Steele dossier is a 35-page document containing raw intelligence compiled by former British intelligence agent Christopher Steele. Strzok’s assertion that the Steele dossier was not the reason why federal authorities opened their investigation undermines what many Trump supporters have claimed and affirmed what former FBI Director James Comey told ABC News in an interview earlier this year. Papadopoulos pleaded guilty in October 2017 to making false statements and material omissions to investigators probing interference in the 2016 presidential election, in relation to his contacts with a London-based professor with ties to the Russian government. 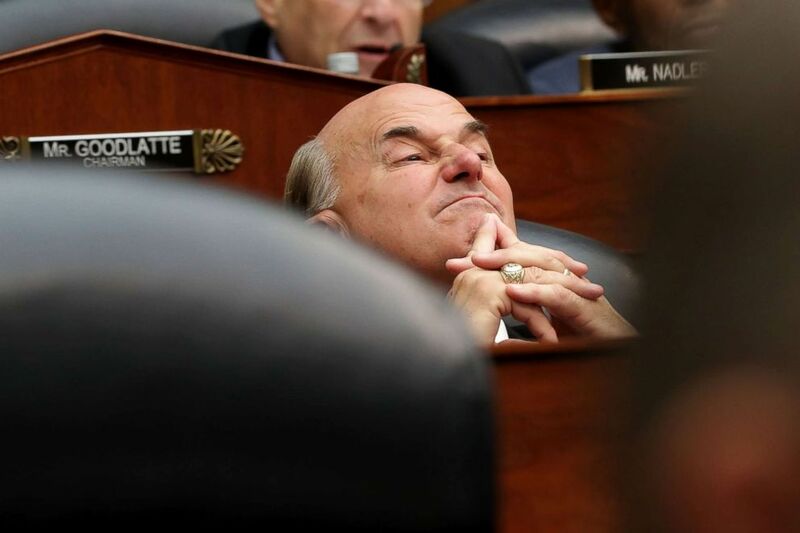 In perhaps the most contentious moment of the hearing thus far, Rep. Louie Gohmert, R-Texas, got personal with Strzok about his affair with Lisa Page – and Democrats cried foul. (Chip Somodevilla/Getty Images) Rep. Louie Gohmert attends a joint hearing of the House Judiciary and Oversight and Government Reform committees on Capitol Hill, July 12, 2018, in Washington. The Department of Justice’s inspector general concluded in their June report that Strzok and Page had engaged in an extramarital affair. A chorus of Democrats objected to Rep. Gohmert’s remark. 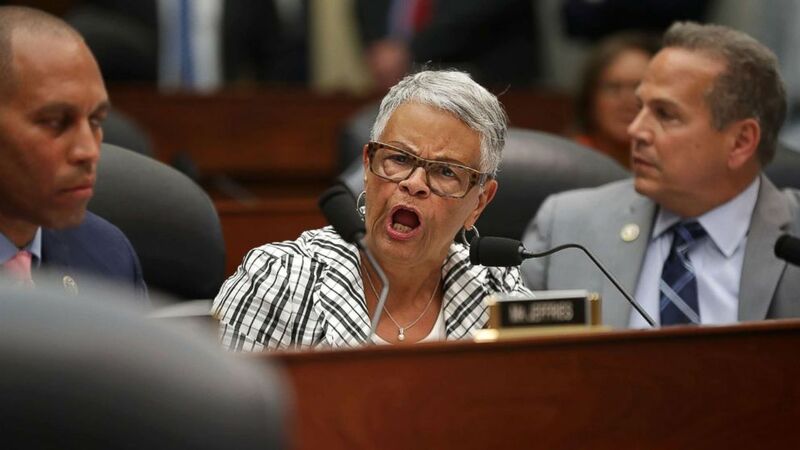 (Chip Somodevilla/Getty Images) Rep. Bonnie Watson Coleman shouts during a joint hearing in the Rayburn House Office Building on Capitol Hill, July 12, 2018, in Washington. As for Strzok, all he said was, "Sir, that is quite a set of statements." "I have always told the truth," Strzok added, "The fact that you would accuse me otherwise, the fact that you would question whether that is the sort of look I would engage in with a family member who I have acknowledged hurting goes more to a discussion about your character and what you stand for." As Republicans continue battering the former FBI agent, at least one Democrat is suggesting Strzok’s performance in front of the committee warrants commendation. Moments later, after an exchange regarding the so-called Steele dossier, Rep. Jim Jordan, R-Ohio, expressed his frustration when Strzok declined to answer. 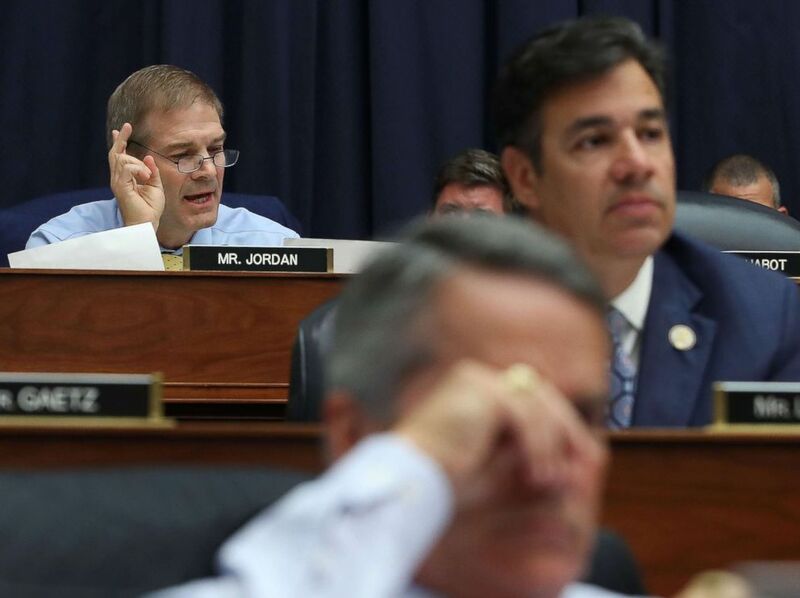 (Mark Wilson/Getty Images) Rep. Jim Jordan questions Deputy Assistant FBI Director Peter Strzok during a hearing on Capitol Hill, July 12, 2018, in Washington. “Sir, it is as frustrating to me as it is to you,” Strzok responded, grinning, adding that he wanted to answer the question but could not comment on an ongoing investigation. After an hour-long intermission for House votes, members trickled back into the chamber to resume questioning. Only about a dozen of the 76-member panel have had a chance to question Strzok, thus far. In the first questioning after returning from the break, Rep. Darrell Issa, R-Calif., asked Strzok to read aloud from a selection of his anti-Trump texts handed over to the committee. Strzok obliged, delivering the texts in a monotone voice, adding that “these texts represent personal beliefs” and again imploring the committee to read the texts within the context of what Trump was saying at the time. (Mark Wilson/Getty Images) Deputy Assistant FBI Director Peter Strzok waits to testify before a joint committee hearing of the House Judiciary and Oversight and Government Reform committees, July 12, 2018 in Washington. As Thursday's joint hearing grinds on into the afternoon, the content of questioning diverges sharply along party lines, with Republicans berating Strzok over his text messages and Democrats lamenting GOP colleagues’ accusations of FBI bias against President Trump. Questioning from both sides, however, remains contentious. Before Strzok finished responding, Ratcliffe stood up and left the committee room. At one point, a frustrated GOP Rep. Goodlatte pressed Strzok to release additional text messages from his personal device. Strzok said he would not. (Mark Wilson/Getty Images) Chairman Bob Goodlatte questions Deputy Assistant FBI Director Peter Strzok speaks during a joint hearing of the House Judiciary and Oversight and Government Reform committees on Capitol Hill, July 12, 2018, in Washington. Rep. Sheila Jackson Lee, D-Texas, took a moment out of her questioning to show the committee a recently-released mugshot of former Trump campaign chief Paul Manafort as evidence that the investigation into Russian meddling is not, she said, unfounded. Strzok gave an impassioned defense of himself and of the FBI. It began by Strzok saying he didn't appreciate how Rep. Trey Gowdy has twisted his words, especially about two text messages: the one saying "we will stop it" about Trump, and one saying Hillary Clinton should win 100 million to zero. Gowdy responded: "I don't give a damn what you appreciate, agent Strzok. I don't appreciate having an FBI agent with an unprecedented level of animus working on two major investigations in 2016." 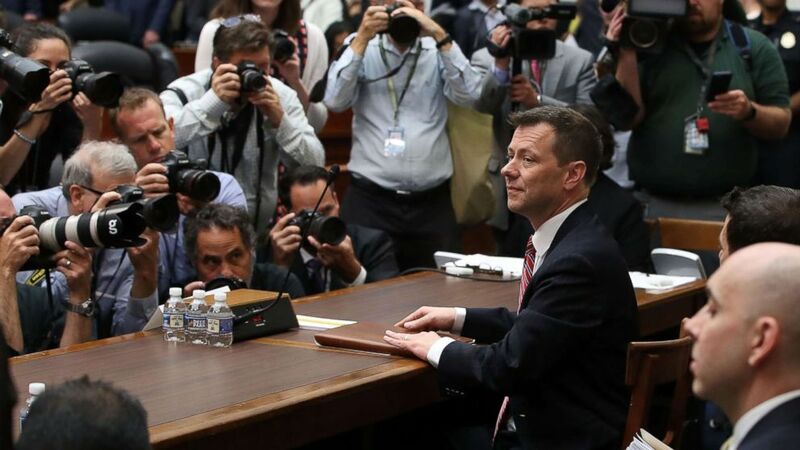 Then, in a dramatic monologue applauded by Democrats, Strzok asked the panel to “understand the context in which” his texts were sent, citing what he called Trump’s “horrible” treatment of a Gold Star father on the campaign trail. (Evan Vucci/AP) FBI Deputy Assistant Director Peter Strzok testifies before the House Committees on the Judiciary and Oversight and Government Reform on Capitol Hill, July 12, 2018. Strzok said it was "my sense that the American population wouldn't vote him into office." "I don't recall writing that text ... what I can tell you is that text in no way suggested that I or the FBI would take any action to influence the candidacy of candidate Trump." 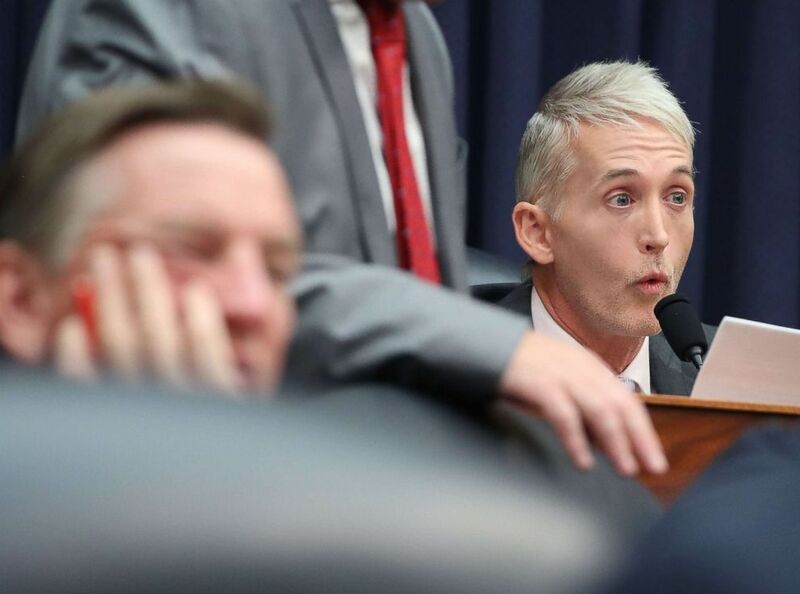 Rep. Trey Gowdy, who had said he didn't care about Strzok's explanations of "context" responded: "That is a fantastic answer to a question nobody asked. (Mark Wilson/Getty Images) Rep. Trey Gowdy questions Deputy Assistant FBI Director Peter Strzok during a joint committee hearing in the Rayburn House Office Building, July 12, 2018, in Washington. Strzok reiterated his insistence that, despite the sentiment expressed in his texts, the FBI’s investigation was not politically motivated and his views had no impact on the probe. “Furthermore, this isn't just me sitting here telling you – you don't have to take my word for it,” Strzok said. “At every step – at every investigative decision – there were multiple layers of people above me: the assistant director, the deputy assistant director, deputy director, and director of the FBI – and multiple layers of people below me: section chiefs, supervisors, unit chiefs, case agents, and analysts. All of whom were involved in all of these decisions. They would not tolerate any improper behavior in me any more than I would tolerate it in them." Strzok made an impassioned plea for lawmakers to understand that the FBI carries no bias. Strzok’s comments garnered raucous applause from Democrats on the panel and some supporters in the room. 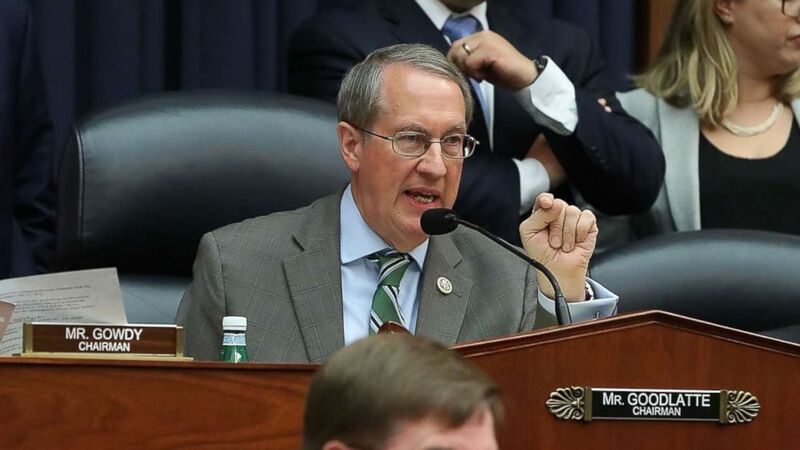 Within minutes of the start of questioning, a highly contentious exchange between Rep. Trey Gowdy, R-S.C., and Strzok ended with Judiciary Committee chairman Rep. Bob Goodlatte, R-Va., saying that the panel will consider whether to find Strzok in contempt of Congress. (Chip Somodevilla/Getty Images) House Oversight and Government Reform Committee Chairman Trey Gowdy arrives for a joint hearing of his committee and the House Judiciary Committee on Capitol Hill July 12, 2018 in Washington. Rep. Nadler, D-N.Y., the ranking Democrat on the panel, then read from U.S. Attorney's manual and cited FBI policy telling DOJ personnel not to answer questions about ongoing investigations. "The question being directed at the witness is out of order," Nadler insisted. 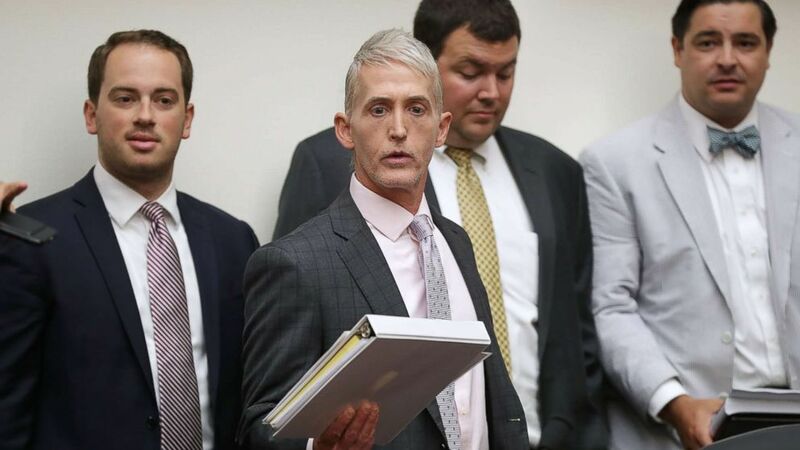 After an even more animated back and forth involving Goodlatte, Gowdy, Strzok, and a chorus of Democrats, Goodlatte insisted that Strzok answer Gowdy's question. In his opening statement to the committee, Peter Strzok conceded that text messages he sent during the campaign contained characterizations of Donald Trump that were “not always expressed in terms I am proud of,” but stood by the FBI’s work in conducting its investigation into Russian meddling. The FBI agent defended his investigative record and insisted his personal opinions did not influence his work at the FBI. “Let me be clear, unequivocally and under oath: not once in my 26 years of defending my nation did my personal opinions impact any official action I took,” Strzok said. In his opening statement, Judiciary Committee Chairman Rep. Bob Goodlatte, R-Va., ripped both Strzok and others at the FBI, claiming they compromised the public's faith in the nation's top law enforcement agency. Goodlatte encouraged Democrats on the joint panel to “replace President Trump’s name with your own name in a small sample of things Mr. Strzok has said,” before reading off a list of some of Strzok’s most controversial texts. “’F Trump,’ ‘Trump is a disaster,’ ‘Just went to a southern Virginia Walmart. I could SMELL the Trump support’ – or, perhaps most alarmingly and revealingly, ‘We’ll stop it’ – referring directly to Mr. Trump’s candidacy for President,” Goodlatte said. The ranking Democrat on the House Judiciary Committee, Rep. Jerry Nadler, D-N.Y., shot back at Goodlatte, arguing that the committee should be spending its time focused on what he says are “other emergencies” the nation faces. "We ought to be holding hearings" on families separated at U.S. border, Nadler said. "It's of more immediate concern than this hearing, certainly."